Enjoy wonderful views of Prairie Lake at this well-maintained lake home. 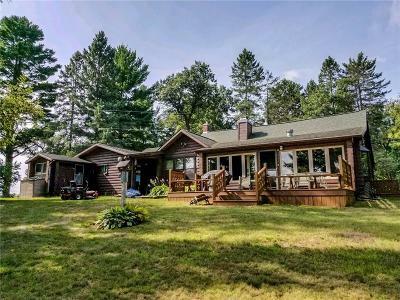 This home is a part of Chetek history; being one of the original Knapp/Stout logging buildings on the Chetek Chain. Vaulted ceilings complemented with gorgeous wood beams. Cozy up next to the stone fireplace or enjoy a coffee in the 4-season porch without compromising beautiful views of the water. The large, private back yard offers a gradual slope to the sandy shoreline and boat house. Summer fun on the water awaits. Directions: From Chetek: Travel North On 2nd St. Turn Left (West) On Dallas St. Stay On Dalls St As It Turns To Hwy Ss. Approx 2mi Turn Right (East) On 9th Ave. Stay Right On 9th Ave. Follow 9th Ave. Property Is On The Left. Sign In Yard.